In today’s competitive sales climate, some unscrupulous builders have resorted to using “scare” tactics to steer potential clients away from their competitor’s product. They make broad over generalizations about other pool types in an attempt to make their product more appealing. Our San Juan fiberglass pools are not exempt from these tactics; here is just some of the myths about fiberglass pools and the TRUTH about our terrific product. Myth 1: Fiberglass pools pop out of the ground. TRUTH: Fiberglass pools are no more susceptible to popping out of the ground than any other type of pool; there is absolutely nothing inherent about fiberglass pools that causes them to lift up. If any type of pool is installed in an area with a high water table, it is the responsibility of the builder to properly install and safeguard the pool against possible damage due to the high ground water whether it is a fiberglass, vinyl lined or concrete pool. Myth 2: Fiberglass pools won’t hold up to freeze/thaw conditions in this climate. TRUTH: San Juan fiberglass pools are suitable for installation in any climate found throughout the United States, from Key West Florida to Seattle Washington and Bangor Maine to Los Angeles California. Freezing and thawing found in the Wisconsin climate has no effect on San Juan pools whatsoever. Fiberglass structures have been used successfully for many below ground applications for the past 30 plus years: underground gasoline tanks at gas stations, built in hot tubs, even fiberglass stair units installed with vinyl lined pools. Myth 3: Fiberglass pools need to be refinished. TRUTH: The gel coat finish applied to a San Juan fiberglass pool is designed to last the life of the pool; this is no different than the finish on home bath tubs’ or a shower surrounds’ gel coat finish that is designed to last as long as the home is standing. You will never need to re-gel coat or paint the pool. The San Juan gel coat finish is the most durable, stain and damage resistant of any interior pool finish, (including vinyl liners, plastered or painted pools). San Juan pools carry a 25 year manufacturers non-prorated warranty on structure; the pool won’t rip, split, chip, crack, or leak under normal use. Less maintenance than concrete by up to 70%. Never needs remarciting or acid washing. Savings on electricity – Run pump as little as 6 hours a day instead of 12 – 24 hours for other pool types. Savings on chemicals. Fiberglass does not leach Alkali (a by product of cement and plaster) into the water – so you use less acid. A pool that outlasts Gunite or vinyl liners in useful life. A pool designed and built by a manufacturer under controlled conditions. Nearly 100,000 San Juan pools have been installed across the United States and Canada, Puerto Rico, and Mexico! More resistant to stains than an ordinary plastered finish or vinyl liners. More economical than vinyl to maintain, no patching or replacement of liners. Smooth non porous finish will not allow algae or fungus to penetrate its walls (light brushing will remove algae easily). No sand blasting or re-painting. Our tile is installed with a silicone latex adhesive and grout which has a built in algae inhibitor to deter algae growth. 17 times stronger (flexurally) than concrete. Structural stiffeners in our side walls provide extra support during installation and back filling. Largest selection of pool & spas available with over 90 models to choose from. In stock pool and spa availability for viewing at the factory. See how your pool is made, before you see it in your yard. 10 day installation – this is the average time needed for your swim ready completion. Most durable, longest lasting pools available. The San Juan color surface is 32 mil thick consisting of two separate 16 MIL applications of gel-coat. San Juan pools can be installed nearly year round without the risk of costly delays and poor quality due to inclement weather. The oldest, largest and most experienced fiberglass pool manufacturer in the country. 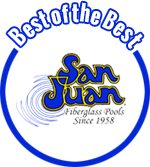 San Juan was the inventor of the one piece fiberglass pool. The first San Juan pool was installed in May of 1958 and is still in use today. The best value for your money. San Juan pools are an easily observable better value! San Juan is a solid company that stands behind its product and has top quality dealer contractors like Capitol Pools, LLC to serve you.